I wanted to try salt water etching because I aim to be The Lazy Etcher, so I’d prefer to just pour the solution in the sink when I’m finished and “chase it down with plenty of water,” as my organic chem professor used to say. I dragged my husband, whom I met in that o-chem lab, to Radio Shack to obtain a single D cell battery holder and a couple of alligator clips. I noted that The Shack also carries ferric chloride in case this method didn’t work. (Ferric chloride just needs baking soda to neutralize it anyway, not that bad.) I also noted the irony that it’s usually the husband dragging the wife to Radio Shack. Thank you for not being an electronics geek, sweetie. Which of these does not belong? Well, they all do in this case. 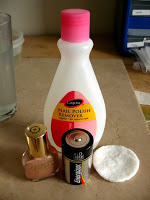 After sanding a piece of 24ga copper with steel wool I cleaned it with acetone (okay, nail polish remover), then alcohol. 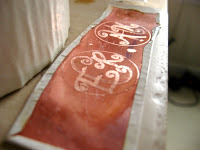 I freehanded the monogram with a Sharpie, which didn’t look awesome but this was just a test run anyway. I put a spot of nail polish in the margin to note the difference in masking quality. I wrapped the back and edges of the copper in duct tape to keep them from being eaten away, then I cut another piece of copper to be the cathode. 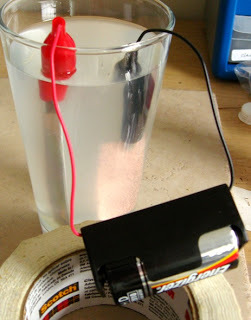 A spoonful of salt, a glass of warm water, and some wirework skills to attach the clips to the leads on the battery. Clippy clippy, dunk dunk, battery in, and I was in business. Bubbles started forming on the cathode, which was a good sign. After about 10 minutes brown sludge appeared around the anode side (another good sign). After 20 minutes I still wasn’t seeing much etching going on, so I added more salt. I let it go for over an hour (instructions found on the web suggested etching for 5-60 minutes), then used acetone to clean off the resist. My design was still shiny while the negative space was matte, which indicated that my resist was working, but there was no cut (nothing was really etched away). Stay tuned for Round 2. Some people say they get into a rhythm when sawing, that it’s actually relaxing. Because for once I wasn’t trying to cut something like a heart out of sheet, I actually understood what they meant. Now if only I could find my spare saw blades. I have moved my studio twice since I needed a new one, so I scrapped the search efforts and finished a ring I’d already cut. 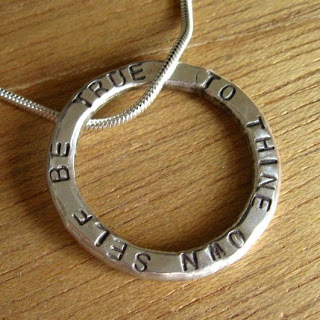 Fused ends, hammered a flat surface, stamped with leaves, then stamped, “To thine own self be true” on the other side. Great idea for a grad! 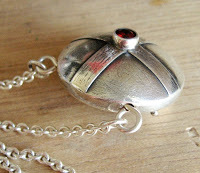 Okay, it’s been a month since my last confession post and I’m the first to admit I am a delinquent jewelry blogger. I have so much going on I don’t even post to my family blog all that much. When all else fails, throw some pictures up there and tell a story or two, right? Here’s a piece that graced my pliers yesterday. A crazy-beautiful Tom Boylan focal, purchased from him in his California studio. Right now it is sitting on my bench, wired to amethyst and pearl links, 11 inches in total. Well that’s not long enough for a necklace, is it? No. I intend to fasten the ends to lengths of chain, but before I can do that I need to make more of my signature spiral hook clasps so that I can get an accurate length before I cut the chain. I have the wire & pliers I use to make the clasps all in a bag waiting for the next football game or car ride so I can sit down and make a bunch at once while I’m a captive audience. The thing is, that hasn’t happened much lately so this project sits, unfinished, until the stars align. 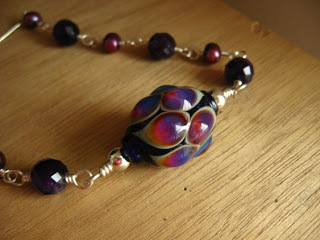 Meanwhile I have been hoarding some Patti Cahill lampwork I purchased a year ago, and finally broke up the set rather than put all the gorgeous eggs into one basket-necklace. First of all, putting all the special beads into one piece makes it pretty expensive (Patti is one person who has great talent and charges what it is worth). Secondly, when I break it up it makes for a nice grouping at the shop downtown. This fall I am in love with peacock blue, plum purple, and olive green…. TOGETHER!!! 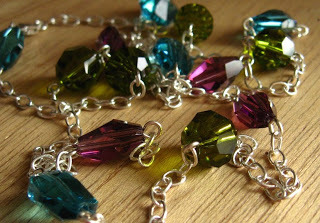 And it’s everywhere, so I figure I’m not the only one who does, so I made a necklace with different shapes of Swarovski crystals in those colors. 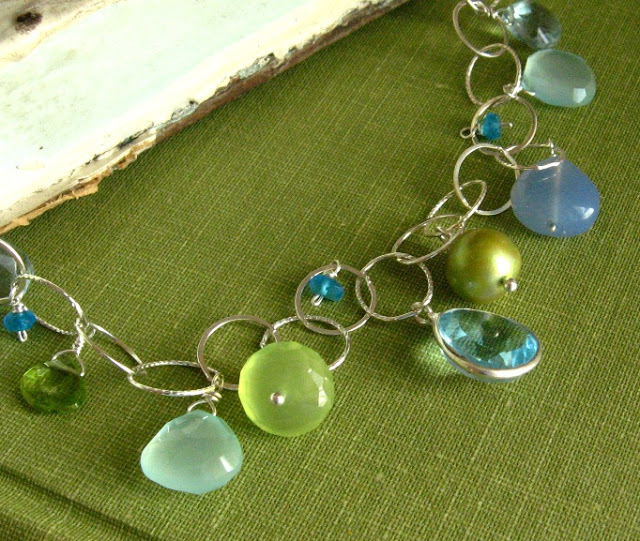 Speaking of following fashion trends, I can’t tell you how many times I have been advised by well-meaning friends to scour fashion magazines to see what “the latest” is and make jewelry like I see in there. If you’ve met me you’ll know that I don’t necessarily wear what is in style, I wear what I like. I tend to make jewelry the same way, not chasing trends and being left with dozens of ear threads when the fad fades, and so far that has worked out for me. If I like what’s in, so be it, but I’m not going to make something just because it’s in. Up next for this lazy jewelry blogger? 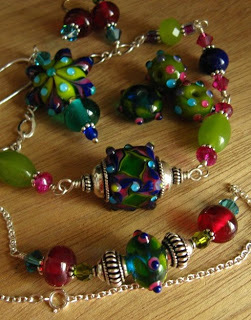 Jewelry tweeting, since I think a lot of my followers found me because of jewelry. 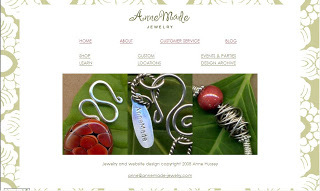 Follow me @annemade or over on my blog sidebar. 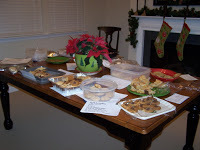 1 cup pecans or walnut halves or macadamia nuts, dried cherries, dried cranberries, or crushed peppermint candy. Heat 1 1/2 cups of the chocolate chips in 1-quart saucepan over low heat, stirring constantly, until melted. Beat butter, brown sugar and vanilla in large bowl with electric mixer on medium speed until light and fluffy. Beat in eggs and melted chocolate until light and fluffy. Stir in flour, baking soda and salt. Stir in remaining 2 1/2 cups chocolate chips, the white baking bar chunks and pecan halves. Drop dough by level 1/4 cupfuls or #16 cookie/ice-cream scoop about 2 inches apart onto ungreased cookie sheet. [I have stacked two 1″ balls with good results, or made 1″ balls and baked 2-3 minutes less.] Bake 12 to 14 minutes or until set (centers will appear soft and moist). Cool 1 to 2 minutes; remove from cookie sheet to wire rack. ——————Update after the exchange: I didn’t end up getting the Andes peppermint crumbles because the grocery store sold out of them long ago. The crushed candy canes worked well, although next time I’ll unwrap them first and put them in one bag to hammer all together. Oh, and one more thing: Have you seen all the flavors of Hershey’s kisses available now? I particularly like the peppermint striped ones, so if you’re going to make these cookies you could just chop those up and have your white chocolate and peppermint all in one. I’m not a big makeup person. I wear it because I know I look better with it on, but a lot of the time I just can’t be bothered to take the time to apply it AND maintain it. Plus it can easily be overdone, especially mascara. I like the look of mascara as long as it’s not applied tarantula-style. But, I cry a lot, rub my eyes, and don’t wash my face before I go to bed, so I usually avoid wearing any. I actually asked around about having my eyelashes dyed, because all I want is the tips to be brown instead of blonde. (Tinting can be done, but I couldn’t find anyone who would actually do it for me. Incidentally, one can also have her makeup tatooed on, which I think would be the ultimate fix for lazy makeup wearers. 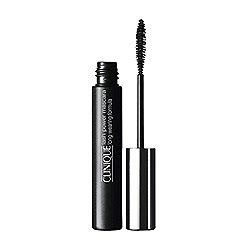 )I bought some natural-looking mascara from Clinique after reading an article in Real Simple. It looked pretty until I wore it on a particularly weepy day and realized it wasn’t waterproof. So I took it back and the Clinique lady suggested I try their Lash Power Mascara Long Wearing kind because it stays in place even in the pool and comes off with hot water. No makeup remover needed (although the same RS article said Almay is the best, for the record). Of course I was all like, “Sure, sure. I’ll try it.” Ladies, this stuff works. It’s a 24-hour formula, so I can even wait until my morning shower to let it wash off on its own. Lazy wins! Okay, so I’m a little behind on the blogging. And the housework. And my Inbox. Steve’s been traveling a lot (although it’s not his fault), and I seem to be happier and get a lot more things accomplished when he’s home. 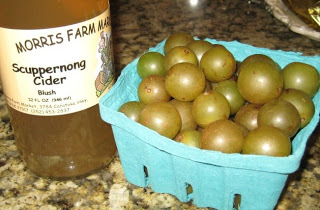 And I seem to have a pretty bad case of Babies on the Brain, so I tend to have more to talk about over on my other blog. 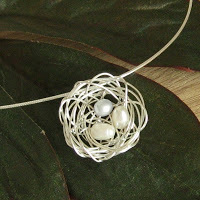 In the jewelry department, I am working on a Bird Nest tutorial (pictured), cleaning off my workbench a little, ordering silver, embellishing some Viking Knit… Of course I like to actually finish something before telling you guys, but I thought I’d throw you a bone to let you know what’s in the pipeline. I went to an awesome bead show in Vienna, VA a few weeks ago and saw some of my favorite lampworkers, including Patti Cahill from Dyed in the Fire. Talk about little works of art! And yes, you heard me right. The market price of silver has been over $21/troy ounce this year and now it is around $9, so I will be adjusting kit prices accordingly. Website update: When I said the site now has a “fresher, high-key” look, I didn’t realize that everybody except for me was seeing just a boring plain white screen aside from the text and pictures. 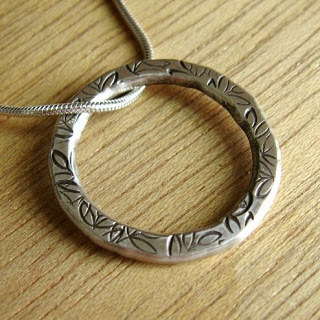 It’s supposed to look like this, with a sage floral print in the background. I posted on a webmaster forum and got a quick response, so the problem should be fixed now. (You may need to hit Refresh to see.) Perhaps the next installment in my book collection should be The Lazy Housekeeper: Easily-cleaned surfaces, those that hide dirt, etc. I personally believe that dust is a protective covering, so my coffee table is actually “flocked”. If you’re in the market for a dog, choose one with short hair that doesn’t tumbleweed, thereby keeping your wood floors cleaner. 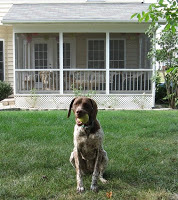 Having a screened porch with brown indoor-outdoor carpeting has really cut down on the paw-wiping necessity, too. Now if I could only find a way to harness the energy in the wagging tail and apply that to the noseprints on the windows. Another book in my series will be The Lazy Gardener. Because the target audience is people who are too busy/lazy/easily distracted to do things the traditional way, this book will focus on plants that have maximum benefit (like perennials with showy blooms or foliage) with a minimum of pruning, watering, and fuss. You have a spot for a plant, you buy it at your local garden center, dig a hole, plant it, water it a couple times, and enjoy it forever with no additional work. 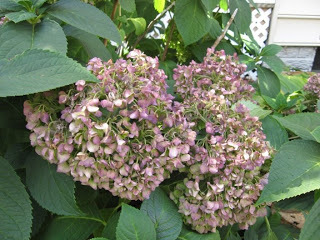 Okay, maybe you could divide it in a few years to share the love, but not because it is too big for the space.Our hydrangea is like this. Unless we have a drought I don’t have to do anything to that thing, and all summer long it produces beautiful blue balls of blooms and then heads of russet and green (shown here) in the fall. And it conveyed with the house so we didn’t even have to plant it. A recurring joke of mine is that I’m going to come up with a series of books for people who are too busy/lazy/easily distracted to do things the traditional way. They’d all be entitled “The Lazy [enter specialty here]” Book number one would be The Lazy Metalsmith. The projects could be completed in an hour or less with a minimal amount of tools. 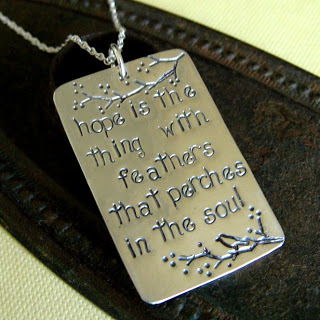 I actually worked on this idea with my friend Cheryl, who has an actual degree in jewelry design from Tyler. I was thinking she’d lend credibility and devil’s advocacy to the project. We sat and drank margaritas one night, hammering out (ha! no pun intended) projects for the book. We started to research publishers. And then we never did anything more with it; I don’t even know where my notes are. A symptom of The Lazy is not finishing big projects. That is why I do better with a smaller scale, like writing tutorials. So, I am pleased to announce that my first PMC tutorial, the Lentil Bead, is now available on my Tutorials page.